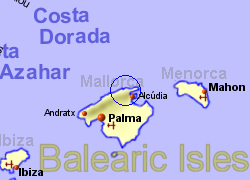 Lying approximately 6Km inland from the Port of Pollensa near the northern tip of Mallorca, Pollensa has narrow streets with many of the buildings dating back to the 17th and 18th century. The main square, Plaça Mayor, has a number of bars spilling out into the square, and an 18th century church. There are also a number of small boutiques and gift shops in the town. From the square, the cobbled tree lined Via Crucis (way of the cross) takes you up 365 steps to a chapel at the top of the hill, a treck popular with turists for the achievement and to admire the views of the town and bay from the top. 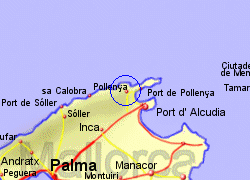 The Port of Pollensa with its modern developments and beaches lies approximately 6Km to the east. The weekly market is on Saturday morning. 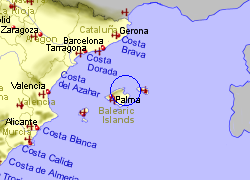 Map of the Pollensa area.